Property, asserts Richard Pipes, is an indispensable ingredient not only of economic progress but also of liberty and the rule of law. In his new book, the Harvard scholar demonstrates how, throughout history, private ownership has served as a barrier to the power of the state, enabling the Western world to evolve enduring democratic institutions. He traces the development of private property, beginning with ancient Greece and Rome, where property rights in the modern sense first made their appearance. He explains how notions of ownership matured in late medieval times with the great expansion of commerce and the growth of cities. He shows how England, as the first country to treat land as a commodity and to develop a robust defense of property rights, also became the first to institute a parliamentary government capable of restraining the powers of royalty. In pre-nineteenth-century Russia, on the other hand, the absence of private land ownership deprived its citizens of the leverage to limit the authority of their tsars. 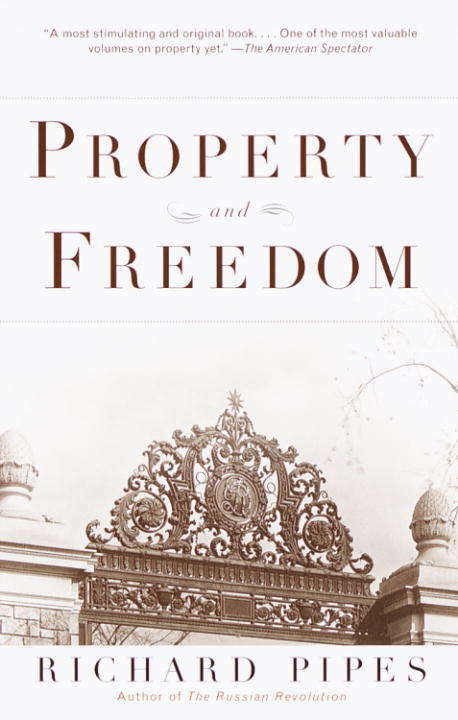 Pipes describes the attitudes toward property of twentieth-century totalitarian states and points out that in the United States the protection of private property, rooted in the principles of the Founding Fathers, has been a major contributor to the commonweal. However, he warns that contemporary trends in the treatment of property--in a century that, he suggests, has been unfavorable to the institution--threaten to undermine the rights of citizens. And he makes clear why he believes that excessive interference by government, even when intended to promote the "common good," could lead to a diminution of freedom.